"What do the numbers mean when my hygienist pokes around my teeth?" Have you ever sat in your dental hygienist's chair and wanted to ask this question? 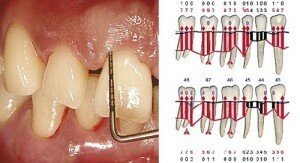 This process is the measurement of your gums which is a vital indicator of health or disease. One of the most common reasons for tooth loss is the loss of supporting bone around a tooth due to periodontal or gum disease. Actually, periodontal means "around the tooth" so disease activity around a tooth, periodontal disease, is important to evaluate and assess so the tooth can be maintained in a state of health. The special millimeter "ruler", called a periodontal probe, is a tool to measure the vertical tissue attachment levels around each tooth. From these measurements, which are taken at six points spaced around the tooth, the level of supporting bone can be calculated. You might wonder why it would be important to know where the bone levels are around each tooth. Similar to cement around the base of a fence post, the surrounding bone supports a tooth. More bone generally means the tooth will be more stable with better long term functionality. 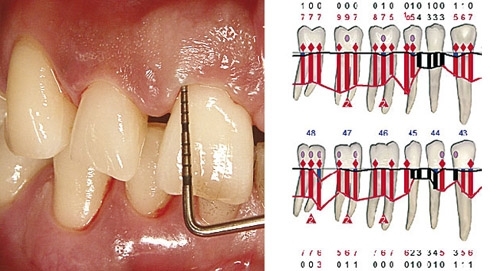 Numbers from 1-3 millimeters are considered a "normal" depth. Measurements greater than 3mm 4 and larger) are considered a pocket and the deeper the pocket the more problematic it is to maintain the area in a state of health. Along with the probing number another factor is also recorded at the same time, called "bleeding on probing" or BOP for short. This represents the current disease activity in that particular area and is mostly a sign of inflammation from bacterial infection. Once the combination of pocket depth and BOP is charted, a specific treatment plan can be prescribed to control the problem so further bone and tissue loss can be minimized. A final evaluation is of gum recession. Gum or gingival recession is loss of bone AND soft tissue surrounding the root surface of the tooth. Since the root surface is more porous than enamel, recession can lead to sensitivity to hot and cold temperature foods and even sweets. Because roots are softer than the enamel part of the tooth, cavities can spread quite fast in recession areas. If recession is left untreated and it progresses, teeth can get loose as the supporting structure (bone and gum) is lost. It is important to have your bone levels and gum tissue checked at your routine dental exam and hygiene appointments. If you are unsure whether your dentist or hygienist performs this check, don't hesitate to ask them. At our office in Manalapan, Specialized Dentistry of New Jersey, this is one of many areas our hygiene team and Dr. Courey and Dr. Zagami check at least annually, so that we can find any problem areas as soon as possible. If you are wondering about your dental health, give us a call to schedule a dental exam and cleaning. Our dental office is pleased to care for patients from Manalapan, Freehold, Old Bridge, East Brunswick, Monroe, Matawan, Englishtown, Marlboro, Toms River, North Brunswick, Matawan, Robbinsville, Spring Lake and Princeton.